In describing this fight scene to you, I am burdened with glorious purpose. I know, I was overwhelmed too. Dashiell Robert “Dash” Parr, the ten-year-old son of Bob & Helen Parr. His brash and feisty nature fits in perfectly with his superpower; both elements have gotten him into trouble at home & school in the past. Early in the movie he vocalized some of the resentment that quietly gnawed at his parents, namely that for the family to deny their true greatness in order to spare the feelings of the “ordinary” is to do a disservice to everyone. Voiced by Spencer Fox. Armed with: his superpower of blinding speed, not just at running but with his whole body. It’s something he’s grown up with but never truly unleashed, thanks to the restrictions placed upon him by his family’s secret exile. Violet “Vi” Parr, Bob & Helen’s older daughter (age not specified but probably 13-14). Violet is at that painfully awkward stage of adolescence, simultaneously yearning for and terrified of attention. Her power set is even more appropriate to her personality than her brother’s. Voiced by Sarah Vowell. Armed with: the ability to make herself invisible and, more importantly from a tactical standpoint, the ability to generate force fields in her immediate vicinity (in this aspect she is more than any of the other family members clearly modeled on a member of the Fantastic Four– namely Invisible Woman, who has the exact same seemingly unrelated pair of powers). She’s had even less exercise of this power than Dash has, owing largely to a lack of self-confidence. This is about to change. Helen Parr aka Elastigirl, the matriarch of the Incredible clan. Like her husband, she’s a former professional superhero forced into retirement, though she’s worked harder to adjust to “normal” life. But this little expedition to Nomanisan proves she’s still got plenty of chops. Voiced by Holly Hunter. Armed with: the power to greatly elongate her limbs, torso, neck, etc. 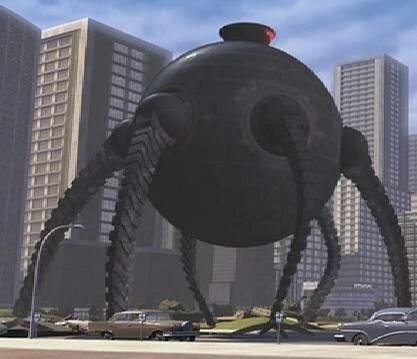 Coupled with the speed & practice she has, the ability is amazing for offense, mobility, and stealth– though I’m not covering it for the blog, one of the movie’s underrated sequences has Helen using her rubbery skills to infiltrate Syndrome’s supervillain fortress. Bob Parr aka Mr. Incredible, needing to be rescued after his introduction to Syndrome and an ill-timed distress call got him captured. Same powers as before and still voiced by Craig T. Nelson. Syndrome’s henchmen, a bunch of particularly nasty goons. Armed with: some are on foot and carry small arms, but most of them are piloting a nifty sci-fi vehicle of Syndrome’s own design. Shaped like a one-man flying saucer and surrounded by a spinning/gyrating blade (ideal for both offense and cutting through the dense jungle foliage), the machines are fast, agile and each equipped with twin machine guns. Though they’re never named in the film, the Internet tells me the devices are called “Velocipods.” Which… sure, okay. Note that all four of the Incredibles are also wearing their spiffy new outfits, courtesy of master super-suit designer Edna Mode. Each one is highly durable, resistant to extreme temperatures, tailored specifically to match each individual’s power set, and outfitted with a distress beacon in the chest. The Setup: Mr. Incredible has been called in for a rematch with Omnidroid on Nomanisan, culminating in his aforementioned capture and the discovery of Syndrome’s scheme. Helen, suspicious about her husband’s absence but ignorant of his captivity, used Edna’s tracking device to get Bob’s location and flew to the island on a borrowed plane. Dash and Violet had secretly stowed aboard, but before she could take them back, Syndrome sent missiles to blow the plane out of the sky. They escaped, but Mr. 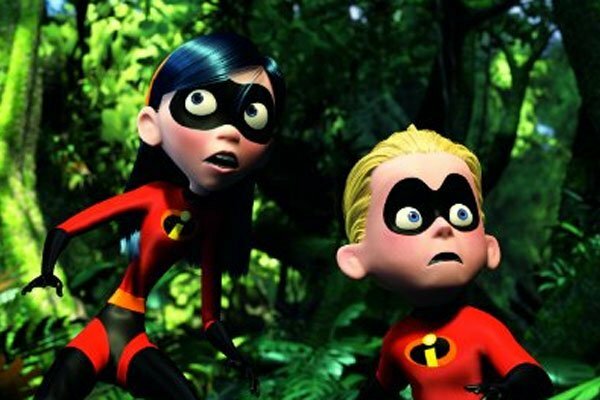 Incredible is left bound and thinking his family’s dead. Having swam to the island, Helen hid the kids in a nearby cave while she ninja’d her way into the villain’s lair. Before leaving, she tried to communicate to them the enormity of the danger they’re in and how they’ll have to fight to protect themselves. It’s a really quiet & powerful scene, with a mother who doesn’t want her children to have to grow up so fast but resolving that she has no other choice under the circumstances, so no point whining about it. A nearby rocket taking off (long story) floods the cave with fire and flushes the children out of their hiding place and into the open. They sleep in the jungle and wake up to a robotic sentry detecting their presence and sounding the alarm, so shortly after, they’re quickly surrounded by Syndrome’s guards. Violet vanishes from sight and reminds her brother to follow mom’s advice (in Dash’s case, to run “as fast as you can,” a prospect that filled him with awe). The boy zooms off with goons in pursuit, one of them remaining behind to look for Violet. The Fight: An embarrassment of riches. To try to describe it “blow by blow” style would be to do it a disservice, not to mention exhausting. So much good stuff happens, mostly involving the pint-sized speedster. All of his antics are entertaining, but there’s a clever escalation to his scenes here– he gets not just faster as the scene goes on but also more crafty and confident. Early on he makes some mistakes and runs into a swarm of bugs, then later a swing on a vine sends him flying off a cliff only to be accidentally (and conveniently) saved by a Velocipod that was swooping by. Standing on the deck face-to-face with the pilot, Dash’s blinding speed lets him dodge all the adult’s punches, and when he first hits back with a quick punch he has a look of amazement that’s perfectly natural from any ten-year-old: “Did I just punch a grown-up and get away with it?” He increases his assault but when he’s distracted by the sight of the cliff the pod’s hurtling toward (the pilot’s back is turned from the flight path), he gets clocked right in the face, and the resulting fall saves him from the crash. Soon, however, he will get by less on luck and more on skill. The kid finds three more pursuers on his tail at one point, and after it’s too late to change course he sees he’s heading out onto open water. Assuming he’s in for a painful splash, he flinches… only to look down and discover that he’s moving so fast, he’s skimming along the ocean’s surface rather than sinking. Finally encountering the reality of his unlocked potential, of seeing what he can do after ten long years of being told what he can’t, he just… laughs. He laughs for maybe a second before zipping off quicker than ever, but there’s so much packed into that one gleeful giggle. It’s the laugh of someone who’s truly, ridiculously, stupidly happy. If this were a different kind of Disney movie he would go into a five-minute musical number about this awesome new power he is (witness the songs about flying in Peter Pan and Aladdin, for example), but The Incredibles accomplishes more with one laugh than other films could with an entire opera of songs. I know it’s subjective, but it’s hard for me to overstate just how indelibly wonderful this moment is. It’s up there with Quint telling the story of the USS Indianapolis, Michael Corleone closing the door on Kay, Kikuchiyo lecturing the other samurai about a farmer’s life, and “you’re all clear kid, now let’s blow this thing and go home.” It’s poetry, full stop. Dash shaking off the last of his pursuers leads to a nice break where we see Helen arriving just as her husband’s being freed by Syndrome’s assistant Mirage (herself in the middle of a Heel Face Turn). They storm out to look for the kids, who are actually doing all right on their own. Dash reunites with Violet just in time to save her from a canny guard who threw dirt at her to detect where she’d been hiding, and she immediately repays the favor by asserting her ability to create force fields just before the guard was about to gun down Dash in retaliation. The two improvise a neat trick where Dash runs in place within Vi’s spherical field and turns the thing into a giant, invincible hamster ball. Some more pursuing Velocipods bounce off before they finally encounter (and non-fatally run over) their parents. The brief reunion is interrupted by a few straggler guards, which the Incredible parents dispatch with ruthless, Papa & Mama Bear efficiency. The hilarious moment where they look at each other and simultaneously say “I love you” in front of an enormous explosion they just caused is priceless, even in a sequence filled with priceless moments. Another squad of goons arrive to spoil the fun, and while last time the kids looked on in awe at a whole new side of their parents, this time the whole family works together. The next bit is as brief as it is spectacular. These four had never fought as one unit until now (heck, until ten minutes ago half of them had never fought a single bad guy at all), but to see the way they work together now you’d think they’d been practicing for years… and why wouldn’t they? They’re family. Everybody contributes. Dash runs circles around the group in order to kick up a dust storm to limit the enemy’s visibility. Violet (her devilish grin signaling the definitive end of her “wallflower” phase) puts up a shield to block automatic fire, while Mom protects her against enemies sneaking up from behind. Dad starts to wreck one of the ships but, unfortunately, it all comes to an abrupt end when Syndrome arrives and instantly traps all four with his cool but narratively boring “zero-point energy” gauntlets, capturing the whole family. Grr. Let’s take a moment to note here that this is not the old G.I. Joe cartoons, heck it’s not even the Ninja Turtles movie– people die in this fight scene. Several of them, in fact, and though it’s all done through bloodless explosions there’s no doubt what happened to the pilots. Causing the death of a human being, even in a justified self-defense context, can be a traumatic thing even for most adults, so on the one hand it’s odd to see Dash and Violet react so casually the first time they do it (maybe they went through some therapy after the credits rolled?). But on the other hand, it’s refreshing for a big movie to take such a no-nonsense approach to the issue of genuinely bad guys, and what happens when you’re up against them in a kill-or-be-killed situation. This scene, though: like it, love it, and gotta have it. Dash is the breakout star but everybody gets something to do. The bad guys are generic but they and their implements are suitably intimidating. Giacchino’s music soars. The staging is fantastic and covers a wide range of terrain. Even in the relatively quiet break in Bob’s prison cell, the pacing never really slows down. And this remains the greatest depiction of a superhero speedster to ever grace a movie scene. Coming Attractions: A giant robot is attacking the city, as those are wont to do.